On Monday March 17th and Monday March 24th Edge Hill University are holding the Reading Support Conference for School Head Teachers and Senior Managers. I am pleased to inform you that the Reading Support Conference has been announced for March 17th and 24th. This is an ideal opportunity for School Head Teachers and Senior Managers to network and focus on reading interventions. The conference, organised by Edge Hill University, is held in London and Manchester. The conference charge is £100+VAT for each delegate. Book now. I am proud to announce that I’ll be delivering a workshop on the two dates. My workshop is for the Better Reading Support Partners as the Reading Support National Adviser. I can’t wait! What are Better Reading Support Partners? Better Reading Support Partners (BRSP) is an intervention for children in Years 1 to 10 who have fallen behind at reading. The children receive individual support. A Better Reading Support Partner is normally a teaching assistant or a volunteer who supports children three times a week. The child reads three books per session and the partner prompts, supports and discusses the books with them. The Partner has 2 days of training and is supported by a link teacher. And it works. In 2013, children achieved an average reading age gain of 11 months after only 2 months of BRSP support. And that’s not all. Their comprehension ages rose by 10 months. Intervention in action. For more information on my workshop please visit my contact page. 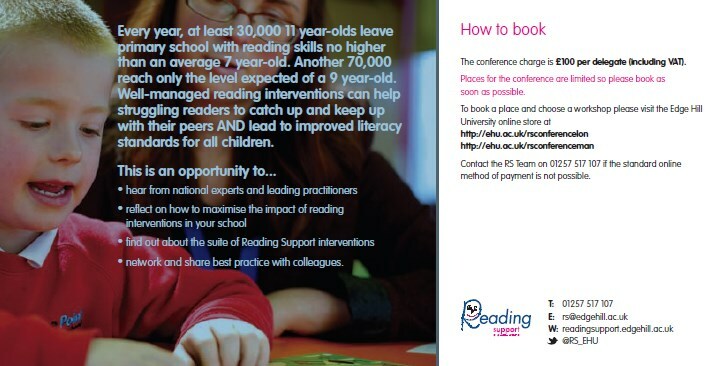 Please call Edge Hill University on 01257 517107 for further details about the Reading Support Conference. There are also more contact details below and inside the flyer. So what are you waiting for?